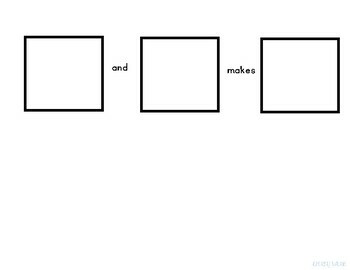 Page 2-3 : Full sheet or half sheet graphic organizers. Call out numbers for students to put manipulatives in the boxes to discover how many manipulatives there are in total. Designed for ____ and _____ makes _____. 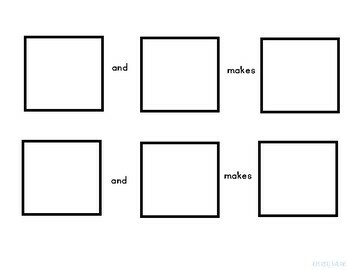 Pages 4-5: Full sheet or half sheet graphic organizers. Call out numbers for students to put manipulatives in the boxes to discover how many manipulatives there are in total. Designed for ____ + _____ = _____. 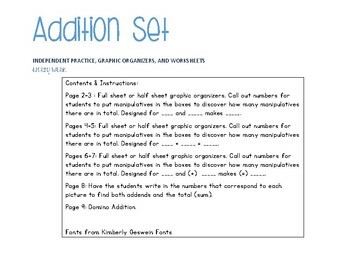 Pages 6-7: Full sheet or half sheet graphic organizers. Call out numbers for students to put manipulatives in the boxes to discover how many manipulatives there are in total. Designed for ____ and (+) _____ makes (=) _____. 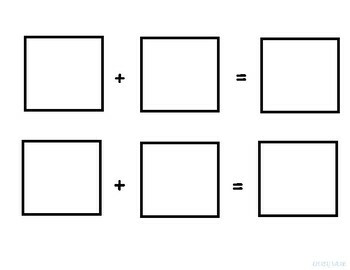 Page 8: Have the students write in the numbers that correspond to each picture to find both addends and the total (sum).